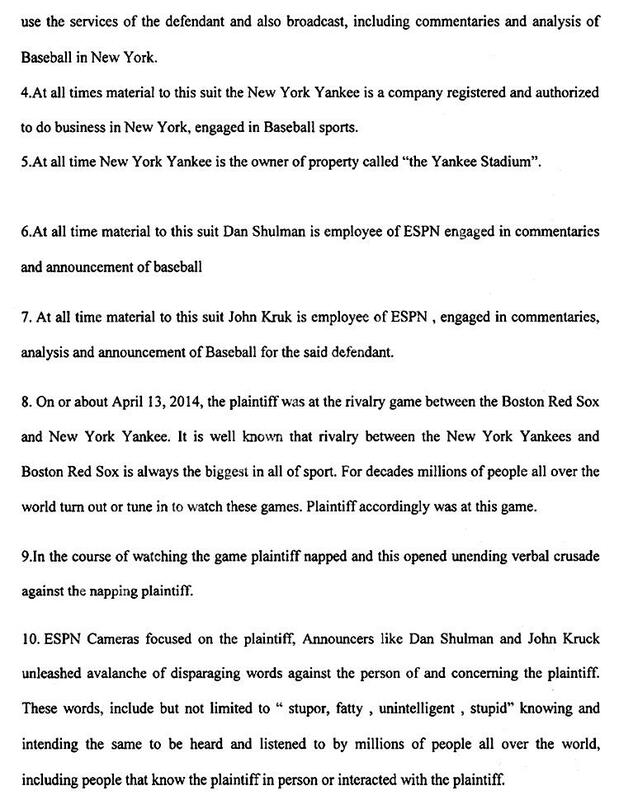 JULY 7--A fan who was shown sleeping during an ESPN broadcast of a recent New York Yankees-Boston Red Sox game is suing the TV network and two of its announcers for allegedly disparaging him during the telecast, according to a lawsuit seeking $10 million in damages. Andrew Rector, 26, nodded off during the fourth inning of an April 13 contest at Yankee Stadium, and was shown on TV with his head slumped to the side as he snoozed in his second-row seat in the ballpark’s lower level. 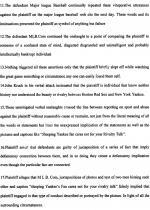 ESPN announcer Dan Shulman referred to the sleeping fan as “oblivious,” while John Kruk, the network’s color commentator, noted that the ballpark was “not the place you come to sleep.” Shulman also wondered whether the fan had slept through a third inning home run by Yankee Carlos Beltran (which, Shulman said, prompted the crowd of 45,000 to “stand up and cheer”). 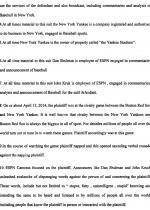 In his complaint, which was filed this month in State Supreme Court in the Bronx, Rector contends that he was subjected to an “unending verbal crusade” by the ESPN announcers. The comments caused Rector, seen at right, emotional distress, according to the July 3 lawsuit. 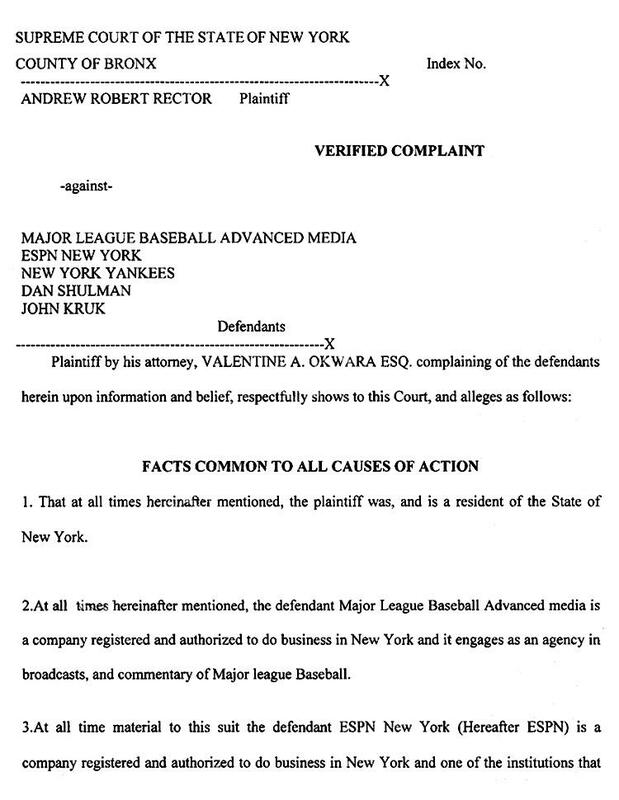 Rector’s lawsuit, which was first reported by Courthouse News Service, also names the Yankees and Major League Baseball as defendants. 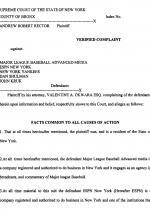 MLB is being sued for including video of Rector snoozing as part of the Sunday night game's highlights package uploaded to mlb.com. 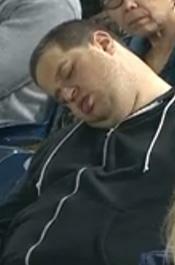 The video apparently prompted viewers to post comments mocking Rector for falling asleep during the game. 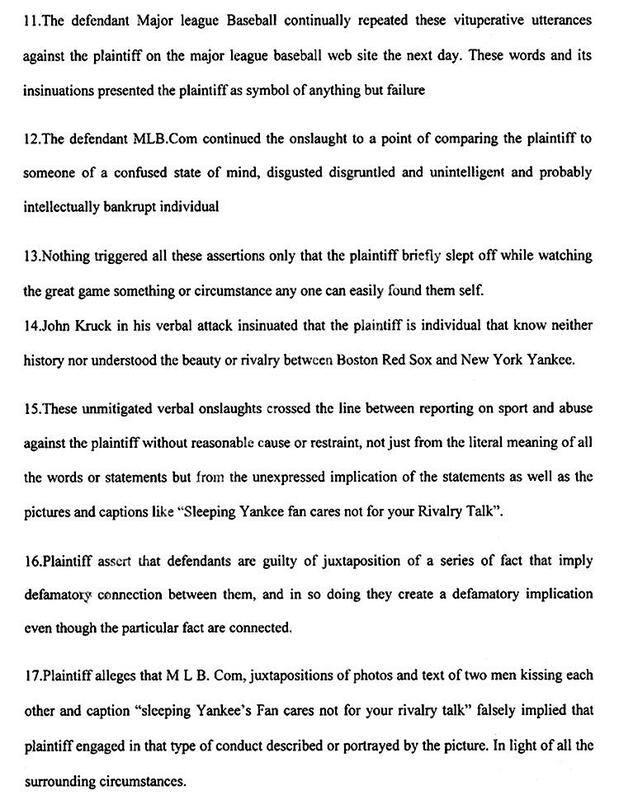 Strangely, the lawsuit attributes these online putdowns to Shulman and Kruk. 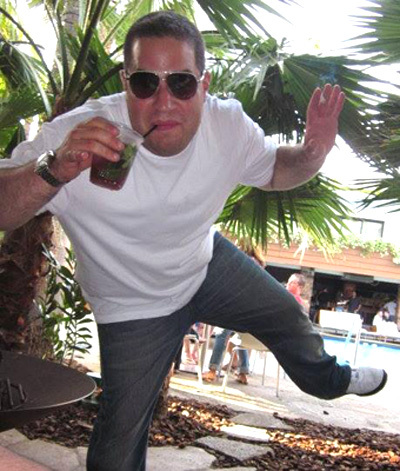 The announcers, the complaint alleges, used words like “stupor, fatty, unintelligent, stupid” to disparage Rector, who works for a Bronx-based auto leasing firm. Rector, who did not return a TSG message left at his office, alleges that he was defamed by comments portraying him as a “fatty cow that needs two seats” and a “confused disgusted and socially bankrupt individual.” During a brief interview, Rector’s lawyer, Valentine Okwara, said that he would only answer press questions after each of the lawsuit’s defendants had been served with a copy of the complaint.